As the world of biotechnology has grown in leaps and bounds, so too have the career opportunities. But the choices can be daunting. What types of jobs are available? How do you get your foot in the door? What will your job entail if you become a “Preclinical Project Manager” or a “Process Scientist”? What’s the difference between biotech and pharma? Career Opportunities in Biotechnology and Drug Development provides a comprehensive and systematic overview of careers in the life science industry, with all their ups and downs. The author, Toby Freedman, Ph.D., has conducted interviews with hundreds of key players in the industry, who provide first–hand explanations of their day–to–day roles and responsibilities, and offer key insights into how they landed those jobs in the first place. Careers in everything from discovery research to venture capital are covered in detail. Each chapter includes valuable sections on preparing yourself for a prospective career: educational requirements and personality characteristics needed; recommendations of books, magazines, and Web site resources; and issues to consider regarding salary and compensation. The book also includes interviewing and job searching tips, as well as suggestions on writing a resume specifically for industry. Career Opportunities in Biotechnology and Drug Development is an essential guide for science graduates and medical, business, legal, high–tech or engineering professionals. With discussions of job security, future trends, and potential career paths, even those already working in industry will find helpful information on how to take advantage of opportunities available within their own companies and elsewhere. 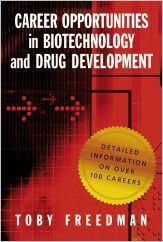 This book will help you make wiser and more informed decisions about what role you would like to play in the biotechnology and drug development industry. 1. The Pros and Cons of Working in Industry: Why Make the Transition?